Norfolk and Suffolk have more in common with each other than with any other English counties, and in terms of church history they are indivisible. Curiously, then, Norfolk has well over a hundred ruined churches, but Suffolk has just twelve, and this is one of them. Westley is an outer suburb of Bury St Edmunds, set charmingly in rolling, wooden countryside, but rather spoilt by the traffic which hurtles through on a rat run from Haverhill to the A14. The church is away from the road at the end of the handily-named Church Lane. At first, you might not find it, because it is hidden from view by a modern housing estate, but if you follow the path to the left of the road it takes you through to a scrubby patch of wasteland punctuated by headstones, and the ruin is beyond. The tower fell here in 1744. The church was made safe, but eventually had to be rebuilt. A choice was made to build the new church, St Mary, on a new site, half a mile away, to provide a decent view for the patron, the Marquis of Bristol, from his house at Ickworth. 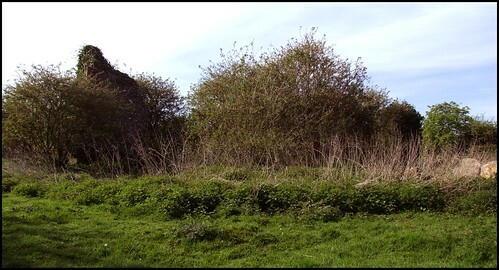 Much remains of the former church, engulfed in elder, ivy and nettles as it now is. If you had come here ten years ago, you would have seen the great arch above the east window, albeit covered in ivy. Unfortunately, the ivy was removed as part of a Community Service Project by a team from the Manpower Services Commission in the late 1980s, with the best of intentions, no doubt. The following winter, frost and wind speedily demolished the arch, and now only the void of the window remains. The site is not quite thoroughly domesticated, and you can't imagine people picnicking here. There are still plenty of gravestones standing, although I couldn't make out the inscriptions. Beyond the church, the fields spread out towards Ickworth.